​Sapori e Saperi means flavours and knowledge. It grew out of my search for a fourth career, this time in the field of food. I had no idea it would take me to Lucca in northwest Tuscany. What we eat and how it’s produced had fascinated me even before my first career as an archaeologist studying the early history of agriculture. Outside the renaissance walls of Lucca, I discovered the modern version of those earlier inhabitants: people who know the hard work and satisfaction of producing the food of their ancestors—nutritious, full of flavour and never boring or standard. These people have become my friends, and for me there is no greater pleasure than taking you to learn with them and experience the delight of a new spectrum of flavours. Before I appeared at their workshops, they had rarely seen a foreign tourist, and most speak only Italian, but they’re delighted to welcome you. Your visit puts money in their pockets, but even more importantly boosts their self-esteem and makes it more likely that their children will carry on after them. ​Alongside the bakers, butchers, cheesemakers and farmers are mediaeval castles, romanesque churches, weavers, blacksmiths, broom and paper makers, concerts and village festivals. A world away from fevered urban bustle, clamorous noise and frightening events. A world where people don’t lock their doors and children play in cobbled streets. Marzio is our driver, but he's also the life and soul of the party. His main job is to keep us on course and get us to where we want to go. But if you're bored watching your olives being processed at the olive press, he'll entertain you by miming to Maria Callas singing Puccini. He's our unofficial language school making it fun to learn Italian. And he teaches our ‘Cooking with Babbo [daddy]’ lesson (with a little help from his wife). He's got a solution to every problem and no request is too much trouble. He's happy to provide a taxi service too, so let us know if you'd like to book him for your own stay in Italy. Francesca was my first Italian friend. She’s a beekeeper and olive farmer who studied art at university. 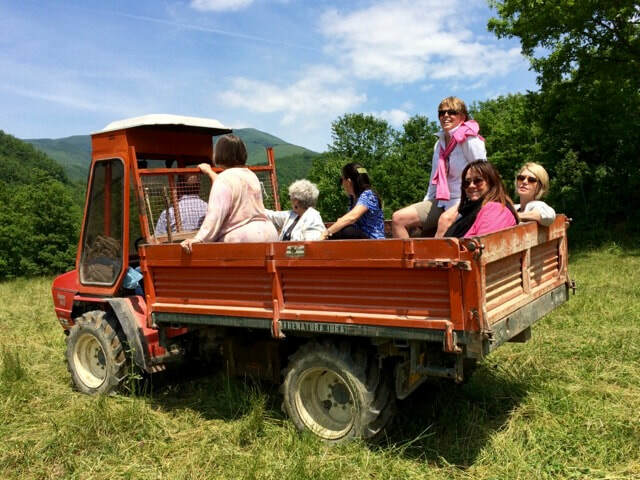 Recently she became Tuscany’s first ‘agrichef’. She converted her old stall and hay barn into tourist accommodation, and I send many of my guests to stay with her. Her role has grown with my business, and now she’s also a guide. Having lived in the Garfagnana near Barga for most of her life, she knows everyone and everything. Her wisdom and great sense of humour ensure you have an unforgettable day. Giulia came to do an internship with me and stayed on. She’s from Florence with grandparents from Emilia-Romagna and now lives in Lucca. When she wanted to get away from designing websites, she opened a B&B. Her obsession with making all the breakfast cakes from scratch eventually wore her out, but she didn’t want to give up helping travellers enjoy her country. Andrea is Marzio’s son and now the owner of their driving service. He studied modern languages at Pisa University and speaks fluent English and Portuguese. Having an American wife also helps. We started a wine sommelier course together. I dropped out after level 1, but Andrea continued and is now a qualified sommelier. He’s the person I turn to when travellers want a wine tour.